A hidden gem (or should I say an easter egg) buried deep in an old report ‘ENERGY TRENDS. June 2011’ published by the Energy Statistics Team of the UK Department of Energy and Climate Change (DECC). This is from page 47 of the report. Flows are in TWh. The flow chart is explained on pages 44 to 46, and the actual data for each of the numbered flows can be verified in the table on page 45. Embodied emissions (similar to embodied energy) is an interesting perspective on the environmental impact of products we use. It takes into account the full life-cycle of the product and aggregates the emissions produced from raw material extraction, from the actual manufacturing, from the transports along the supply chain, and from the disposal of the product after use. In many cases ’emissions’ is reduced to greenhouse gas emissions (GHGs) and the impact on climate change caused along the product’s life cycle. In this case we could colloquially also call it the ‘carbon rucksack’ of the product. Kate Scott from the Sustainability Research Institute, School of Earth and Environment, University of Leeds (UK) in her article ‘Extending European energy efficiency standards to include material use: an analysis’ suggests the European Union should – in addition to its energy efficiency policies – add consideration of material efficiency of products to their climate change strategy. GHGs are considered a lead indicator for material efficiency, as “material-intensive manufactured products … offer significant scope for emissions reductions along product supply chains. 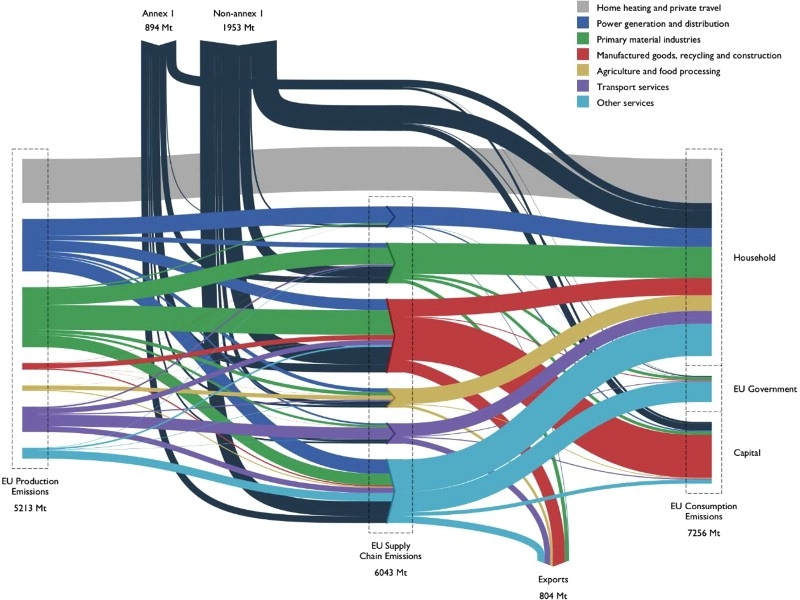 This Sankey diagram of supply chain emissions associated with global product flows of the EU is presented. Source: Kate Scott, Katy Roelich, Anne Owen & John Barrett (2018) Extending European energy efficiency standards to include material use: an analysis, Climate Policy, 18:5, 627-641, DOI: 10.1080/14693062.2017.1333949 distributed under Creative Commons Attribution License. The diagram doesn’t show much detail as to the individual stream and relies heavily on color coding. Only group sums are shown. Data is for the year 2007. Flows are in Mt (megatonnes) CO2-equivalents embodied as emissions in the products. The black streams from the top represent embodied GHG emissions from raw materials, finished products or product components imported into the EU. 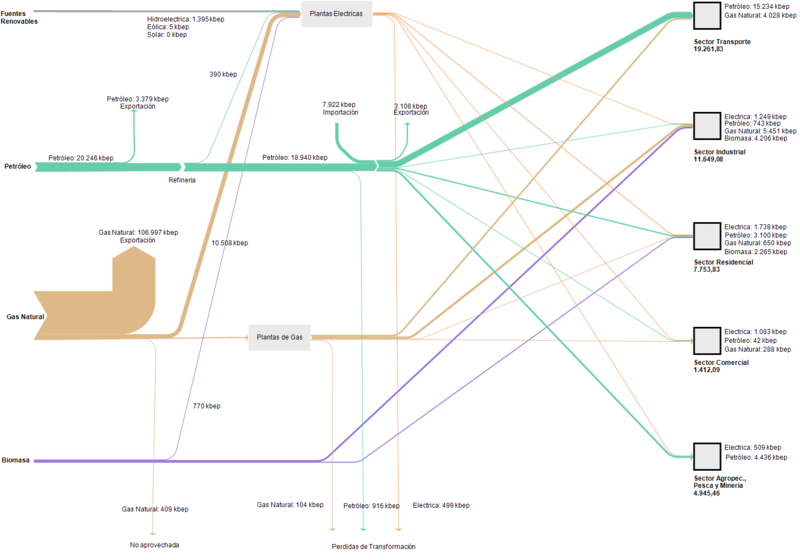 Another Sankey diagram, found on the D2Service EU research project web page. Amsterdam-based graphic designer Nadieh Bremer (a winner of a 2017 Information is Beautiful award) has created this Sankey diagram for the H2 2018 shareholder report of Adyen. Definitely a novelty in a financial report (at least I have never seen a Sankey diagram in a such a publication). Apart from the fact that it is beautifully crafted and clean, it is also quite a tweak of the d3.js Sankey library … After all, this is not the typical d3.js Sankey diagram (with left-to-right orientation, only with boring grey bands, or even arrows superimposing each other where they curve). Here we have a top-to bottom flow, with streams branching out to the left and to the right, flows smoothly curving in to join the main streams, saturated color, and an interesting hatching pattern on the nodes. Nadieh writes on her decision to use a dedicated software: “The main reason was the fact that the final numbers could change (slightly) until just days before the publication, making it quite a chore to have to remake these if they were all crafted in Illustrator. This “dense” or “block-style” Sankey diagram might look familiar to some. 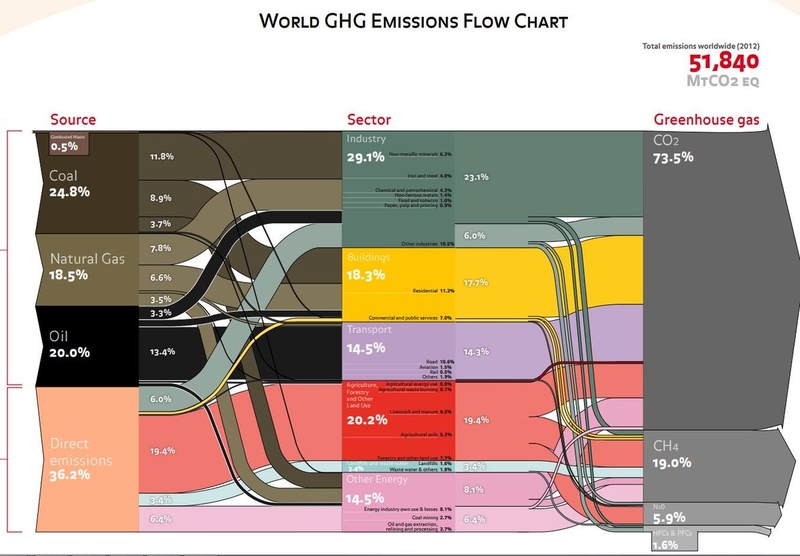 Indeed it is based on the greenhouse gas (GHG) emissions Sankey diagram for 2000 published by the World Resources Institute WRI (see this post). Consulting firm Ecofys (now Navigant) has updated the data and refined it, but kept the overall appearance of the figure. Total emissions of climate gases were 51,840 Mt Co2-eq. Carbon dioxide and methane contributed more than 90%. The industry sector is the largest emittor, followed by agriculture and land use. Very clear and compact Sankey diagram, conveying the most important information about GHG emission sources. Deloitte Sustainability in a 2017 report titled ‘Blueprint for plastics packaging waste: Quality sorting & recycling’ showed the results of “a quantitative and a qualitative analysis of the main packaging resins (PET, HDPE, LDPE, PP) based on the flows in France, Germany, Italy, Spain and the UK, which represent 70% of the plastic waste generated in Europe”. 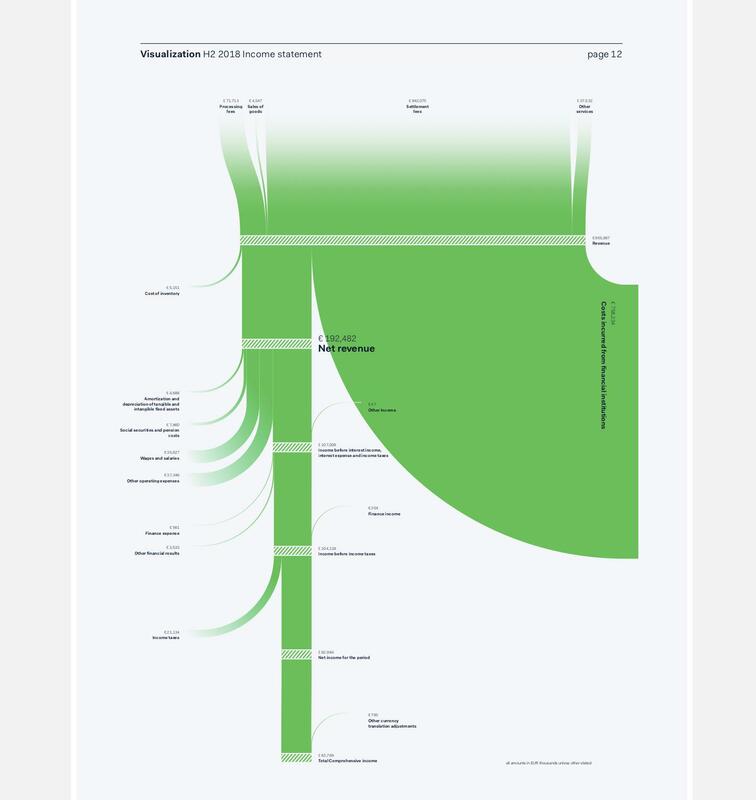 The plastic waste streams for the year 2014 are shown as a Sankey diagram on page 16. The collection rate that year on a European average was at 37% and the recycling rate at 13%. Most of the packaging waste goes to incineration and landfill. The study also looks at improvement potential in plastics waste collection and recycling. The plastic packaging waste streams for a possible 2025 scenario with a collection rate of 74% and a recycling rate of 55% is also shown as Sankey diagram for comparison.